Now that so much media is electronic or digital, it's hard to imagine there was ever a time before print media was invented. The earliest civilizations only had oral communication. If they had news to tell, they ran to the nearest person to spread the word to others, who each did the same until everyone had heard the news. Then people began to write down their news in picture form and then in crude languages where symbols stood for words and letters. It took the inventions of paper and the printing press for print media to come into regular use. Once it did, there was no turning back. Simply stated, print media is the printed version of telling the news, primarily through newspapers and magazines. Before the invention and widespread use of printing presses, printed materials had to be written by hand. It was a painstaking process that made mass distribution impossible. At first, news was chiseled in stone. Later, it was handwritten and posted in a public area much like today's posters or read from a scroll by a town crier. As early as 131 B.C., the ancient Roman government produced daily news sheets and informed the public in this way. Through the years, print media evolved to include entertainment, educational topics and more, instead of only conveying news. Around the year 932, Chinese printers adapted wood blocks, which had been used to print illustrations and small amounts of text, and started producing popular books more easily. Each page of text was one block that could be used repeatedly to make the books. About 100 years later, China's Bi Sheng invented movable type by carving individual characters onto small blocks of clay. Each small block was hardened by fire to become a porcelain piece that could be used again and again. The pieces were glued to iron plates to make a page. Using each page hundreds or thousands of times, he could mass produce news quickly. When the printing was done, the pieces were removed from the plates to be used again to make other pages. Bi Sheng's invention had limited success in China because the Chinese alphabet's characters are so large that they were difficult to put on movable type. His idea spread all over the world, however, and others adapted it using other materials such as wood, tin and copper. Still, the process was too cumbersome to mass produce a newspaper for the public. In 1440, Johannes Gutenberg introduced his invention of a movable type printing press with type that was much easier to change, making the mass production of news pages possible. The invention spread throughout Europe, and printing and distributing sheets of news became popular. The World Association of Newspapers considers the first newspaper to be The Relation, which was published in Germany in 1604. It was published regularly (weekly), disseminated to the public and covered a range of news, from politics to entertainment. The Oxford Gazette was the first English paper to be published, starting in 1665. It moved to London the next year and was renamed the London Gazette. It is still published today as the official publication of government news. Although the early American colonies published news sheets, the first true newspaper was published in Boston in 1690. Called Publick Occurrences Both Foreign and Domestick, it ran into trouble for publishing political criticism. Its publisher, Benjamin Harris, was arrested and all copies were destroyed. While the American colonies were adamant about freedom of religion, freedom of the press was another matter. The first successful newspaper in America was the Boston News-Letter in 1702. Its publisher, John Campbell, was careful not to publish any criticisms of the government. When Ben Franklin's brother was arrested in 1722 for publishing news critical of the government, he turned over his paper, The New England Courant, to Ben. Ironically, the early mass-produced newspapers cost close to what most workers earned in a week, so only the wealthy could afford to buy them. Wealthy people were more likely to be literate at that time too. By the 1830s, though, publishers were able to print newspapers for about one cent per copy, making them truly available to the masses. By 1900, newspapers were very popular because more people were literate and papers were affordable. They included the features we recognize today, including attention-grabbing headlines, news, society pages, sports, comics and the occasional use of spot color in special instances. It's been said that a picture is worth a thousand words. Writers may beg to differ, but it can't be denied that pictures grab attention and enhance the written word, whether in a book, in a newspaper or on a billboard. Images have been used along with words since the early days of printmaking. There are four ways to make prints from an original piece of art: relief, intaglio, lithography and screen printing. Choosing which type to use depends on the effect the artist and printer want to achieve. Relief printmaking uses wood, plastic or metal that the artist cuts into, cutting away the portions that won't be printed. When ink is applied to the surface, it highlights the raised areas, much like a rubber stamp does when pressed into a stamp pad. Woodcut has been used for centuries due to the availability of smooth hardwoods. Linocut is a more recent 20th century version of woodcut that uses linoleum. Wood engraving uses wood with no grain showing to achieve fine detail, and plastic is often used instead of the wood. Intaglio works in a nearly opposite way. Instead of creating raised areas, the artist etches grooves with an instrument or with acid. When ink is applied, it seeps into the grooves. The printing press pushes paper against the surface and ink in the grooved areas is printed. Different techniques can be used in intaglio to create soft lines, shading and detail. Lithography uses a flat piece of material, such as limestone or aluminum. The artist applies a greasy medium, like grease crayons, or a more liquid grease solution to the areas to be printed. After treating the surface with a chemical solution, the ink adheres to the greased areas. Screen printing, also called serigraphy, uses silk or another fine mesh material which is stretched tightly on a frame. Areas that aren't to be printed are blocked off with paper, glue or specially made stencils. Ink is applied and pressed through the fabric with wood to which a rubber blade has been attached. (Think of a squeegee pressed against a surface to push water away.) The screen process is repeated for each color used, blocking out areas that aren't to be printed in that color. Offset printing uses lithography to print on flat surfaces, like paper and plastic. When color is used, printing presses have a separate unit for each color and typically apply black ink first, followed by the colors one at a time. When mass quantities are needed, such as when printing newspapers, a large roll of paper may be used instead of individual sheets. Flexology can be used to print on other materials, like cellophane and plastic labels, but is also sometimes used for newspapers. This process has a rubber plate that is inked and applied to the printing surface. Rotogravure is a longstanding process that uses a cylinder instead of a flat plate. The image is engraved onto this cylinder and ink is applied. 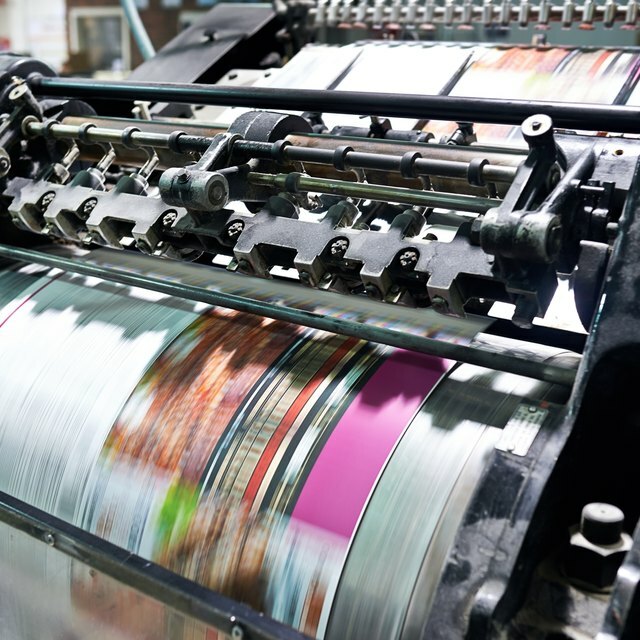 It's been used for both newspaper and magazine printing but is often substituted today by offset printing and flexology, depending on the purpose. Digital printing using inkjet or laser printers has replaced many other printing processes because of the availability of accurate and affordable printers that can print on many different materials. Newspapers faced competition with the introduction of electronic media, which includes radio, television, CDs, DVDs and the internet. Radio and television are often called broadcast media because they are broadcast for all to hear, rather than reading print media. Radio transmissions began in the early 1900s but didn't take off until NBC began in 1926 and CBS began in 1927. People were fascinated by the ability to hear the news instead of just reading it. Families gathered around their radio sets listening to the news of the day, particularly during events such as elections, presidential speeches and news during World War II. Television was introduced at the 1939 World's Fair. It was merely a curiosity at this point, though, since its cost was roughly one-third of the average U.S. household's annual income. Technological advances resulting from World War II made television affordable for the masses in the 1950s. Advertisers jumped at the chance to reach housewives through soap operas, aptly named because the dramas were sponsored by soap manufacturers. By the 1960s, families gathered around their television sets as they had for radio decades earlier. Watching shows together became a nightly ritual. Television programming wasn't round-the-clock as it is today, but it started with a few programs at specific days and times. Cable channels expanded programming to all hours of the day. By the 1980s, businesses sported desktop computers in their offices, and soon it became common to have one at home too. The World Wide Web was introduced to the public in 1991. When Google introduced its search engine in 1998, people suddenly had a way to get vast amounts of information easily. Generations of people who grew up with internet availability at their fingertips began to get their news and conduct their research online instead of in print, and the internet became a clear competitor to print media as a way to spread news and information. Print media, such as newspapers and magazines, responded by hosting online websites in addition to their print version, and some even closed their print medium to become a wholly online medium. Others ceased production and closed their doors completely. The predicted demise of print media, however, hasn't happened. Many people use the internet but still like to hold a physical newspaper or magazine in their hands. It's familiar and reliable and not prone to glitches or outages. Physically turning the pages gives a feeling of satisfaction and control unmatched by any electronic medium. New print vehicles that cater to today's audiences continue to open. Many successful magazines have popped up as a result of popular TV programs, particularly food, home improvement and health shows. Instead of trying to compete with electronic media, successful print publishers look at what's popular in digital media and enhance it with print versions like HGTV Magazine, Rachel Ray Every Day and Martha Stewart Living. Health publications like Prevention are still flourishing, as well as health niche publications like Shape and Runner's World.